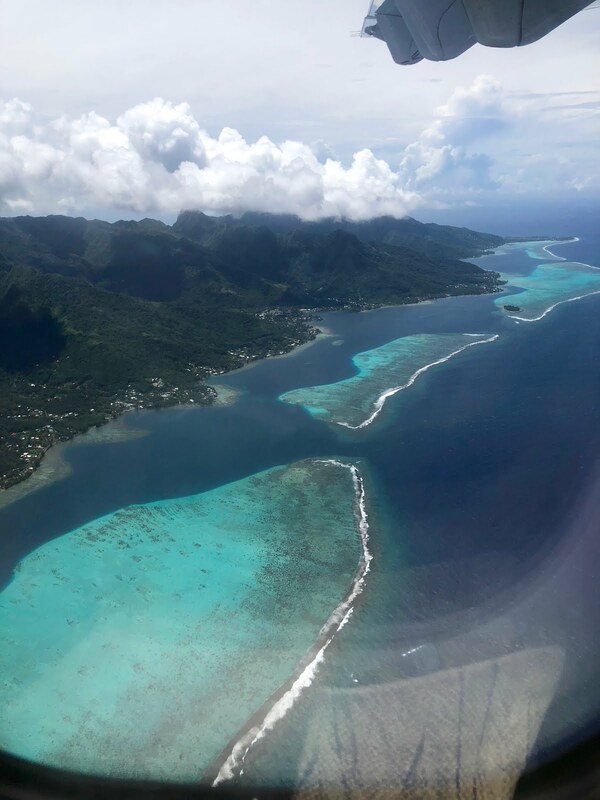 After five glorious days in Moorea, we set off for Bora Bora. 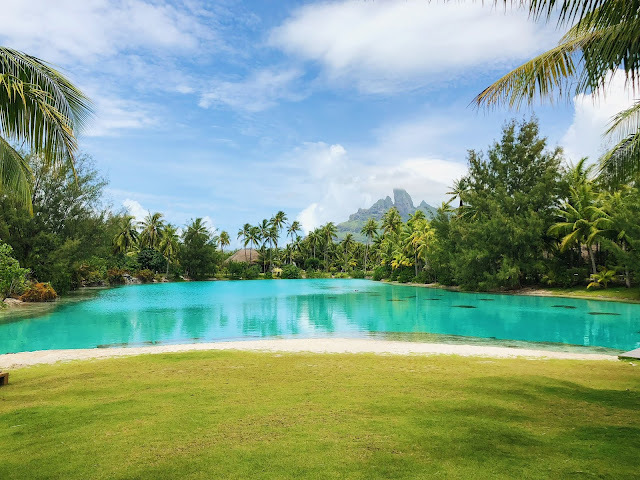 As I mentioned in the previous post, Bora Bora was the intended destination for this trip, and while I had a blast with my friends in Moorea, I was really looking forward to three days of chill-out time in paradise. 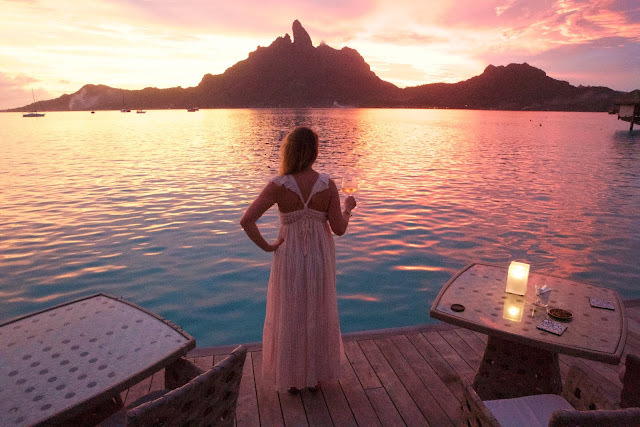 Unlike with Moorea, I had done very little research for Bora Bora, which ended up being a good thing. And while I had seen countless photos of this little island, I had no idea how special and beautiful beyond words it would actually be. To get to Bora Bora, like Moorea, you have to fly into Tahiti first, then switch to Air Tahiti and take a smaller plane. 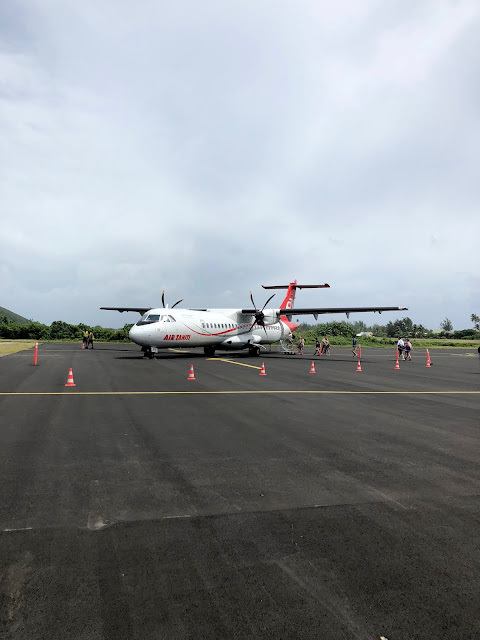 Since we had traveled to Moorea via ferry, we left out of the Moorea airport, and I was not at all prepared for how low-key it was. In fact, I was a little worried we weren't leaving enough time to check in, but once I got to the airport, I had to laugh. Basically, you walk up to the check-in desk, hand them your passport and your bag, they give you a boarding pass if you haven't printed one out already (seating is first-come, first-serve like Southwest), then you walk outside and get on the plane. No security, no X-rays, no metal detectors. I felt like I had time-travelled back to the 1960s. (Adding to that feeling: our plane had propellers!) The flight was about 50 minutes, and they serve you some very delicious pineapple juice. When you land, you pick up your bag and find your hotel—if you stay on the outer barrier island, as we did (it's where the more luxurious hotels are), you get to take a boat to your hotel. That's right, a boat! 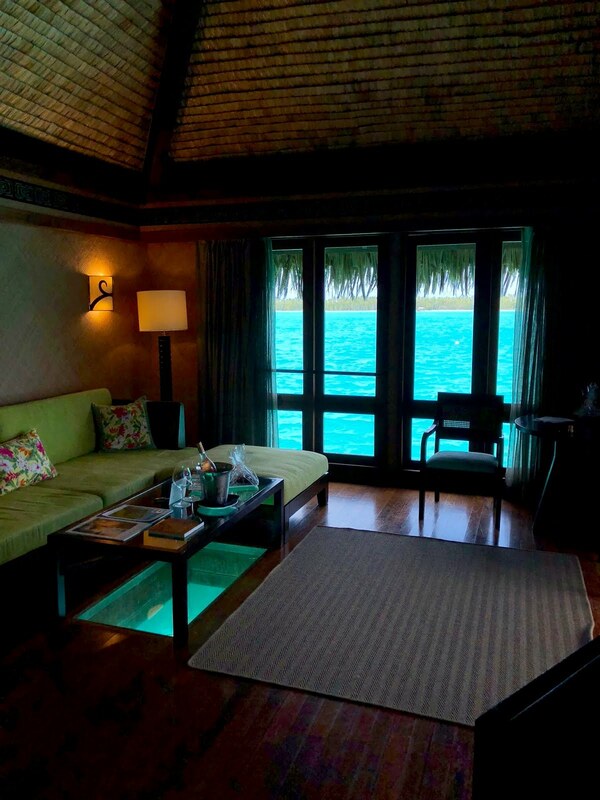 I knew there was one place I wanted to stay on Bora Bora, and that was the St. Regis. I have done a lot of traveling in my life and stayed a lot of wonderful hotels, but I've never stayed anywhere as remotely luxurious as the St. Regis. Like, I would give this resort seven stars instead of five if I could. 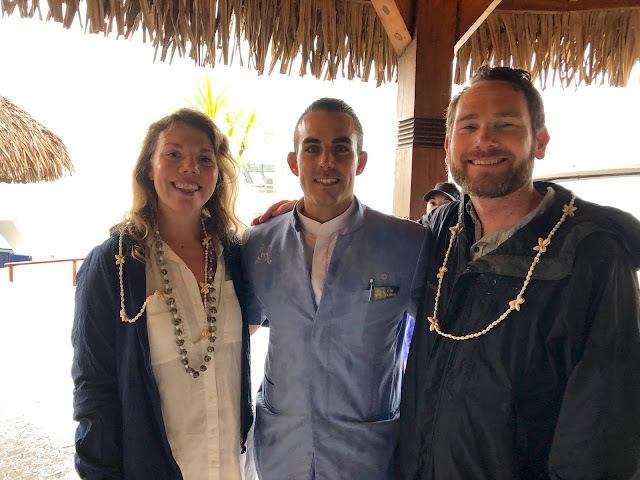 The service was above and beyond—we had a butler, Ché!—the grounds and facilities were stunningly beautiful, and our room was HUGE (it was actually like four rooms). 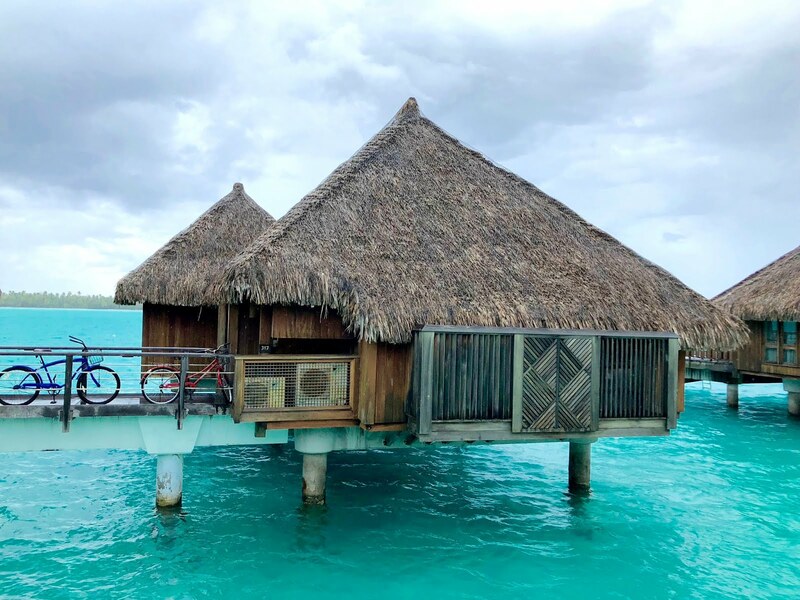 You don't have to stay in an overwater bungalow, but hello, you're in Bora Bora, so why the hell not? Ours had glass panels in the floor so that we could see the fish swimming underneath; we also had a separate bedroom with a huge king-size bed; a bathroom with a tub, shower, and two sinks; and my favorite part, a huge outdoor deck where we ate breakfast each morning (once we figured out room service was the way to go vs. the buffet). 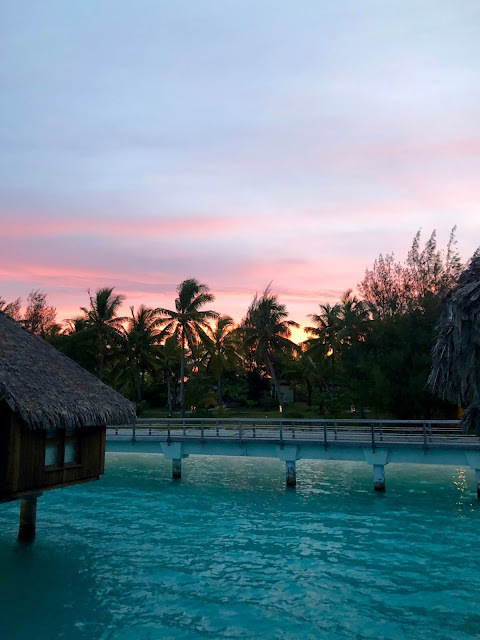 One of my favorite parts: unlike Moorea, we were allowed to crank the air conditioning 24/7! The resort is so large—44 acres!—that walking is not the most efficient way to get around. You can have a golf cart drive you (which, I discovered, was really fun after you've had a couple drinks), but our preferred mode of transport was bike. You can also use their snorkeling equipment, kayaks, jet skis, stand-up paddle boards, and sailboat. 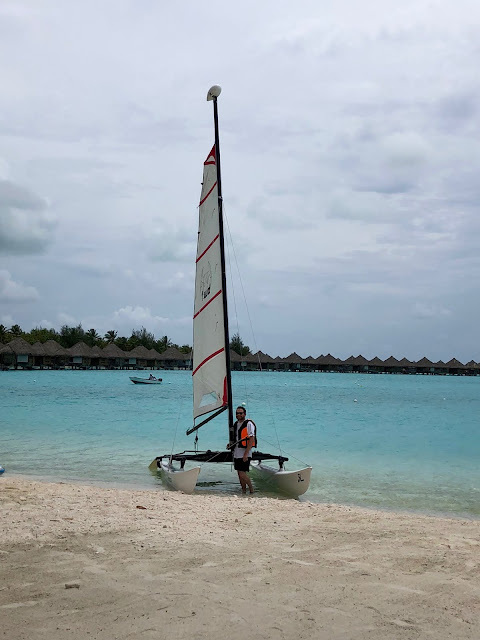 My boyfriend took me out for a spin on this Hobie cat sailboat, which was super fun! The resort also has a Lagoonarium, where you can snorkel to your heart's content. 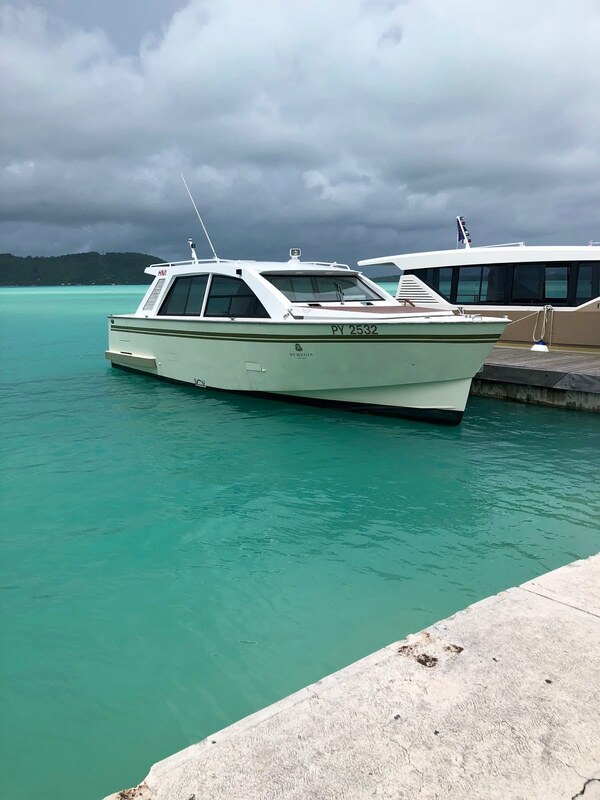 We thought it was going to be kind of lame—it's monitored by a marine biologist, who does a public feeding every day—but we saw so many cool fish and kinds of coral that we ended up snorkeling for several hours. And did I mention there's a hammock in the water? We ate breakfast and lunch at the resort every day, but our butler, Ché, was very helpful in setting up all of our dinner reservations. The first night, we went to Bloody Mary's, which is a Bora Bora institution, and everyone tells you to go there (they have a celebrity wall of fame outside the restaurant). 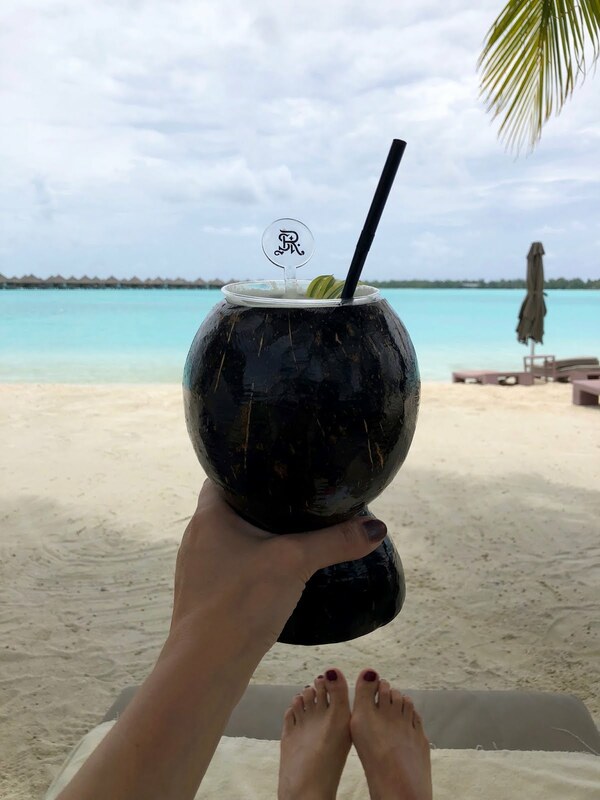 The schtick is that you walk in and see the day's fresh fish on ice; you order right away, then you have a seat (on a coconut-tree stool!) and your food is brought out to you. I'm glad we went...because we decided we wanted to spend the rest of the time at the resort. 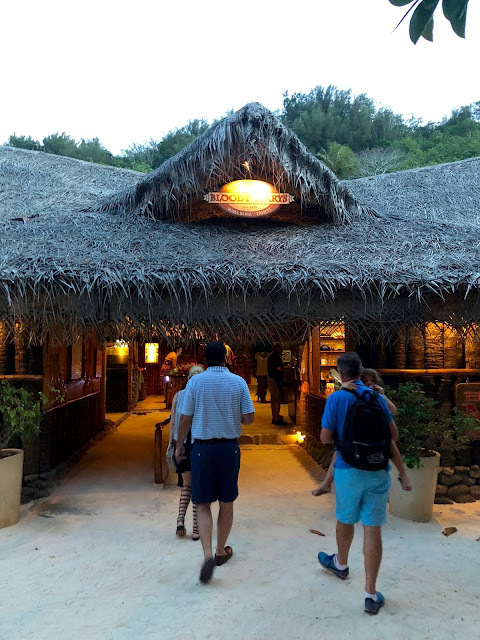 It was fun to take a boat ride there, however, and compare notes with the other couples, some of whom went to the same place as us and some of whom went to other restaurants on the mainland—it's all very coordinated with the boat and van drop-offs and pickups. 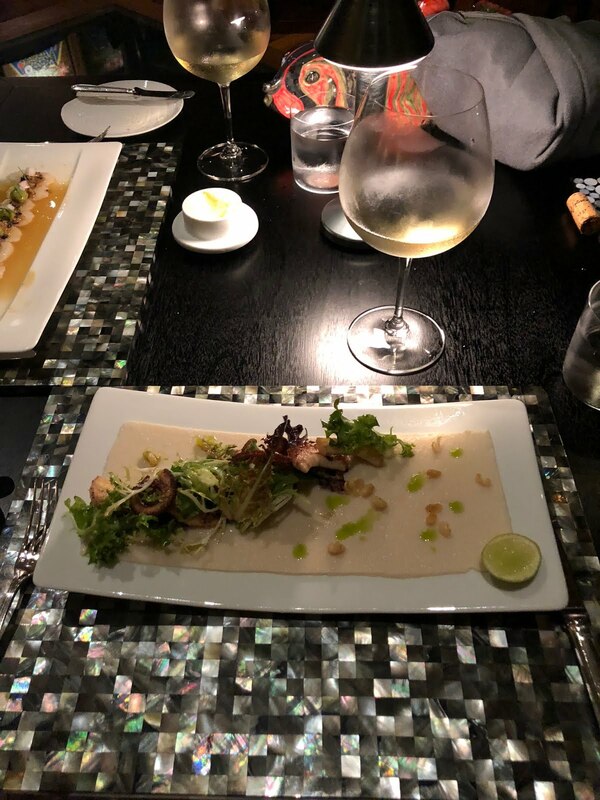 The other two nights, we ate at the St. Regis, at Bam Boo sushi the first, which was fantastic, and Lagoon by Jean-Georges, which was one of the best meals we had on the entire trip. It's been years since I'd eaten at Jean-Georges in NYC, and now I'm thinking I need to go back. Anyway, the draw with this place is that they have sharks swimming underneath, so whenever conversation got a little dull (just kidding!) we just looked down at the floor. 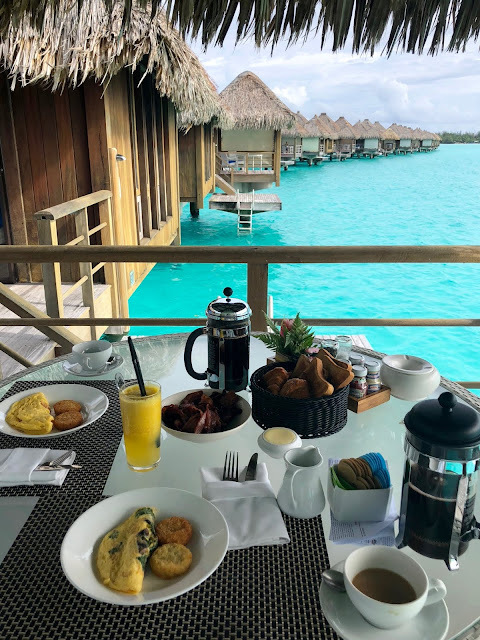 One thing to note: food and drink in Bora Bora is ridiculously expensive. Like, I had a $39 club sandwich for lunch on my first day; Whispering Angel rosé was a veritable bargain at $19 a glass. It's like Hawaii—everything needs to be flown in on an airplane, so there's a premium. This piña colada was $32 but it was damn good. We were blessed with a beautiful sunset in Moorea, but that did not at all prepare me for the sunsets in Bora Bora. The photos do not do them justice—they were hands down the most gorgeous sunsets I've ever seen. A funny thing about the St. Regis: the movie Couples' Retreat was filmed there, and not only is the St. Regis proud of this, they have it playing on a continuous loop. 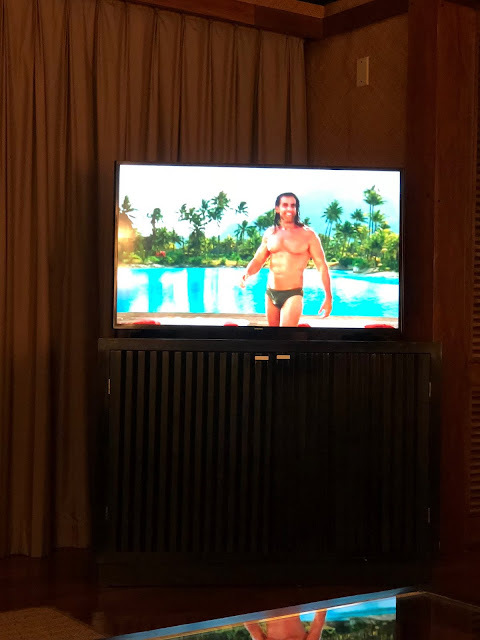 Other than CNN, it's the only channel that's in English, so we ended up watching it most nights, and, based on conversations we overheard—"Oh, that's where they filmed the yoga scene! "—so did everyone else. 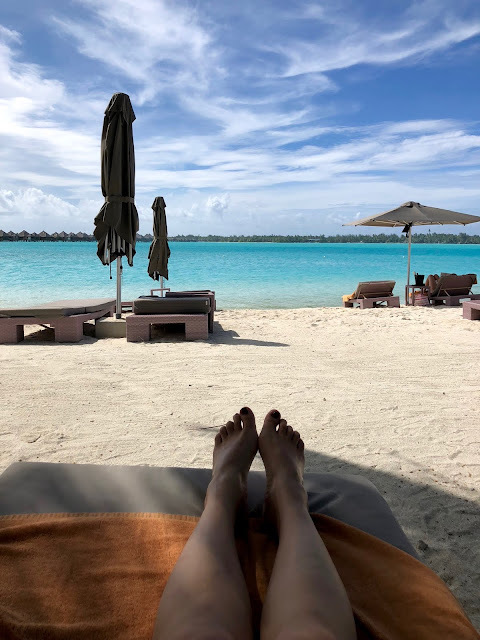 I loved our stay in Bora Bora so much, I literally sobbed the day we left. This is us with Ché; my face is embarrassingly puffy from crying. 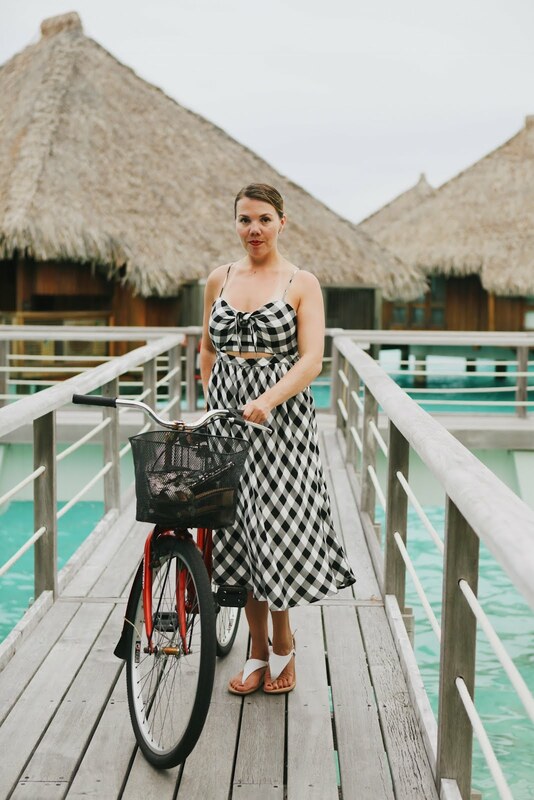 In case you missed it, here's my Moorea travel diary. Oh my!!! I want to go to Bora Bora now!!! Thank you for sharing. This looks like the trip of a lifetime! Bora Bora is on my travel wish list! I'd love to go one day! Wow... what an exotic place. So rich in beauty! I love where you stayed, too. That water! So pretty! It looks amazing! The water is so gorgeous. It would be a dream to visit Bora Bora! 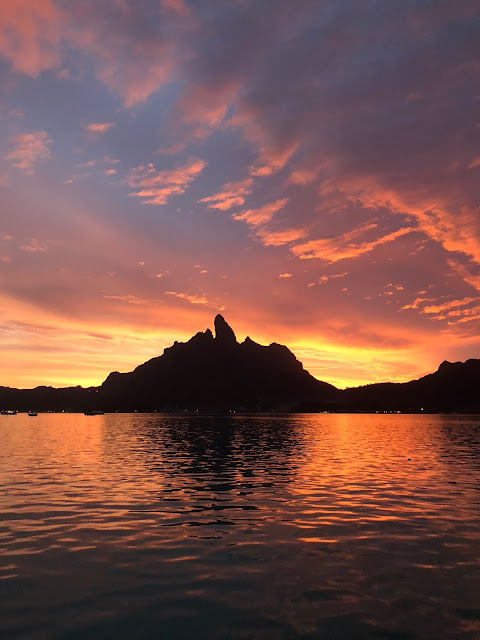 It looks beyond gorgeous and sounds like you had an amazing time! 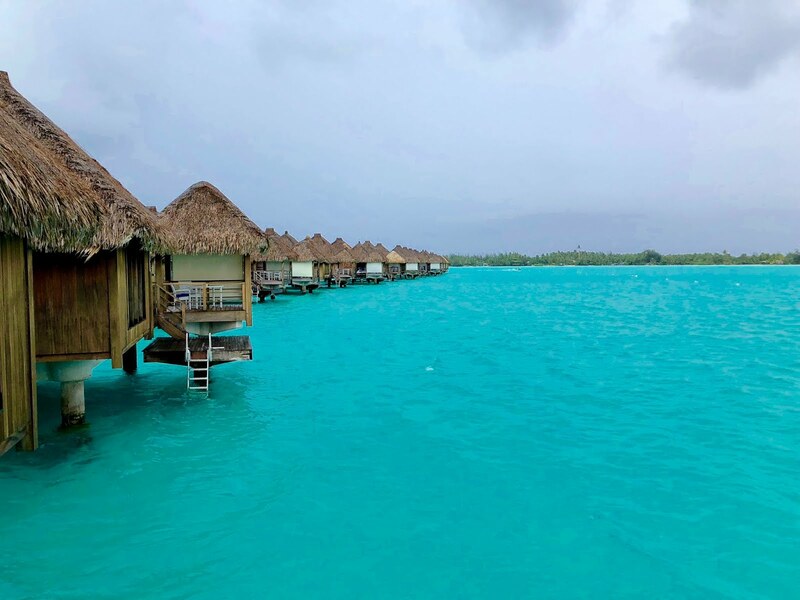 Bora Bora is literally at the top of my list! So gorgeous and that water! Wow! This looks amazing! I want to go!! It looks amazing here Cheryl. 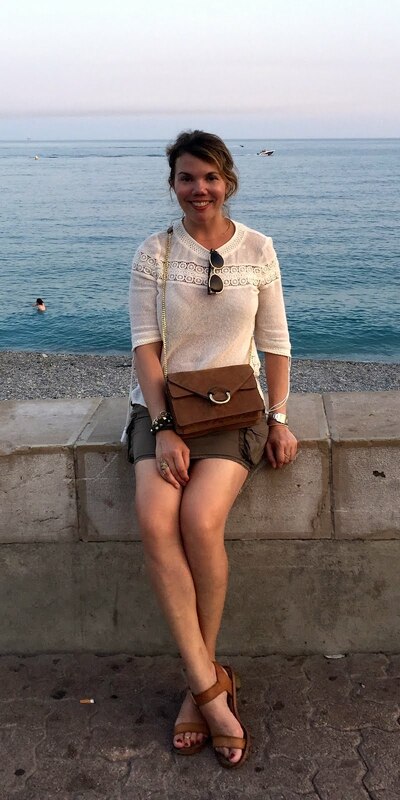 I wish I could visit :) The sea looks amazing, Thanks so much for sharing your post with us at Welcome To The Weekend Blog Hop. Have a great week and we hope to see you soon.